Here it is... the unveiling of my little project! Thank you to everyone who participated! The idea for this video came to me the day that I first heard the Bruno Mars song "Just the Way You Are". I immediately thought of Sweetpea. And I thought - "BLOG POST!!!". I thought it would make a perfect little love note for me to send to Sweets on Valentine's Day! But then... I know that I am not the only person who feels that way about her child. I know that I am not the only one who feels that way about EVERYONE with diabetes. So I decided to ask all of you to join me in this little project! As the pictures started rolling in, we put them into a special folder. And I would open that folder and look at all those beautiful faces. Different ages. Different genders. Different backgrounds. All sooooo beautiful. Each and every one! Knowing what it takes to live this life. Knowing how strong they are all. Know how beautiful they truly are - inside and out. Diabetes can be an ugly disease. But today I want to forget the pain and the ugliness.... and focus instead on the LOVE and the BEAUTY! Here is my little love note to the DOC. I hope you enjoy it! BEAUTIFUL!!!! Thank you for taking the time to do such a wonderful thing for the DOC. I have chills and tears watching all of those absolutely beautiful faces. sniff sniff. Great job Hallie. Happy V day to you. So blessed to share this journey! Well you made me cry like a baby! Thank you for the time and energy you put into this piece of beautifulness! Despite the pain behind this disease, these beautiful faces still shine! 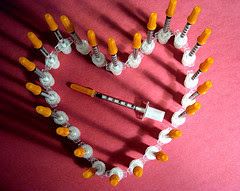 Happy Valentines day to all the children, adults and families who triumph daily over Type 1! Oh Hallie, this is BEAUTIFUL! I'm in tears. Thank you for putting this together. All those sweet faces, those brave kids (and grownups!) Such wonderful happy smiles :) Love them all. Happy Valentine's Day! Beautiful Hallie! Thank you for that...you are awesome! How beautiful... thanks for taking the time to do this. It was so wonderful and heartbreaking at the same time. Heartbreaking to see all those sweet faces, but wonderful to know that we are not alone in this. Tears for me too. Hallie this was truly beautiful. Thank you! Watched three times! I'm in tears This is so well done and just amazing. Every face in this video gives me, and every other Diabetic hope.. Absolutely beautiful! Thanks for all of the hard work you put in to this, what a special gift! Happy Valentine's Day to you and yours! Thank you for this and thanks to the DOC for being there. Wow! That was absolutely amazing! I have so many "friends" on Facebook that I know have children with diabetes but seeing all those precious faces really gets to me! Thank you so much!!! the video was amazing no doubt but I felt like one of the most amazing parts was the massive amount of people you have touched. The sheer volume of individuals who found out and sent you the photos is amazing! You touch many people everyday and I hope you know how important you are! Thanks a million for doing this video. And for once I didn't cry...I looked at all those beautiful faces and just smiled. Simply beautiful! Oh Hallie - thank you so very much! These faces just amaze me, inspire me and make me proud to be part of the DOC! Thank you so much for putting this together! Happy Valentine's Day! Thank you so much! That was beautiful. Thank you Hallie! What a tremendous gift to give to the DOC today. The faces of all of these sweet peeps are truly inspirational. You my friend are so caring and giving. Happy Valentine's Day to you! WOW..How wonderful this is! Lily and I set here watching it together and we absolutely love it! Thank you so much for putting so much time and effort into this, you did an amazing job! So many beautiful perfect faces! Well worth the wait! :) Hallie it was beautiful. Thank you for taking the time to put that together. I can't wait to show Liam! Thank you for this beautiful gift on Valentines Day. So precious and near and dear to my heart. These faces will play on my computer on a continuous loop all day long. My heart is with every child in this video. Thank you for this wonderful, beautiful gift! All those precious faces! I'm in tears, but video was a wonderful gift. Truly beautiful! Thank you! So many AMAZING kids!! I'm here crying too... wish that so many wonderful kids did not have to have this awful thing in common. Thank you so much for taking the time to put this together! Wow. Thank you for making me blubber in front of the kids. Absolutely beautiful. And, so hard to see the faces of kids I know from the DOC. Good HELL - I have not cried this hard in quite sometime! Hallie - you did a beautiful job - simply beautiful. Thank you so much for making such a wonderful video and thank you for including Nate. Oh my...absolutely beautiful. What a touching tribute to these little heroes. You did a wonderful job - thank you so much for putting this together. I can't wait to show my daughter (Ella, dx at age 3 in July 2008) so she can see how many other children are dealing with the same things she is. Thank you! I do so love that song. What a wonderful job, Hallie. So many beautiful and familiar faces. I finally got to sit down and watch it and am in tears.